We rolled into Past Tense After Dark and were immediately struck by the immense waterwheel that adorned the cider mill. The night sky shone bright with stars, the fall air had just the right amount of bite and thrill-seekers swarmed the farm like insects. 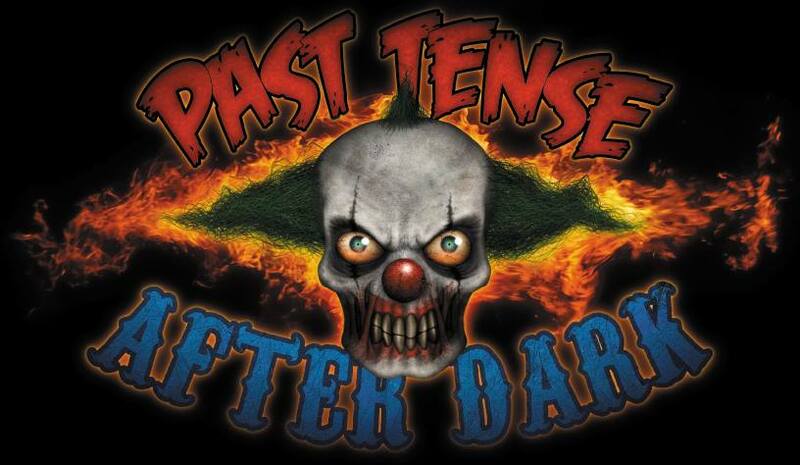 The nocturnal activities at Past Tense After Dark included the Cornmaze of Fear, Hayride of Despair and the marquee attraction, House of Horrors. John and I started for the rear of the property and soon found a massive field of corn sprawled out in front of us. Prior to entering the maze we were warned by the keeper of the corn that the trek would be a long one, possibly in excess of an hour, and were additionally cautioned that should we become too terrorized we could resort to using a safe word. But honestly, John and I would never stoop so low. The Cornmaze of Fear was certainly large and confusing and featured a variety of dead ends. A team of strategically placed scarecrows loomed ominously above the stalks, keeping a watchful eye on all who braved the corn. A handful of live actors also patrolled the maze although they were more concerned with providing a scare than aiding us in our quest to best the maze. In one memorable moment, we crossed paths with a small group of teenagers, one called out to a friend who had become separated from the pack — Tiffany. After a couple of attempts the unseen Tiffany answered back but any thoughts of a reunion were cut to ribbons when the chatter of a chainsaw tore through the night. I like to think that Tiffany will be among the scarecrows next year. We never did find the proper exit but did manage to navigate our way back to the entrance. House of Horrors is the marquee attraction at Past Tense After Dark and was an eclectic fusion of haunt tropes that resulted in an highly enjoyable, unique experience. The adventure began on a wooded path, fog drifted through the air which carried the distant shrieks of fellow thrill-seekers. We walked past a humble cabin and then through the heart of a mausoleum were one well-placed creep gave us an unexpected fright. Following several twists, the path choked us into a building — a hotel with more in common with the Stanley than the Ritz. A disfigured bellhop bounded in our direction with a level of enthusiasm that inspired a degree of unease. He led us to an elevator and closed the door behind us; a bumpy ride ensued. When the shaking ceased and the door had opened to a new floor we were greeted by an attractive woman; her role at the hotel was unclear but not unwelcome. We were led through a couple of finely detailed hallways toward the back of the building. A vortex tunnel stood in our path, once clear of it I paused and looked back at the structure from which we had just emerged, it appeared to be a charming abode. We would later learn that it used to function as a greenhouse. Our stay outdoors was short as a larger building loomed before us, and from its bowels echoed strange sounds. John and I entered and were immediately swallowed by perfect dark. We groped blindly as a loud, bizarre cacophony of noise bombarded our ears. It was an aural assault that suggested the gadgets in a science lab had gone haywire all at once or perhaps it was the surreal language of the planets captured by precision instruments. No matter the case, the effect was disorienting and nerve-wracking. Something furry brushed against my lips and I thrashed in the dark. A rhythmic thumping could suddenly be heard in the distance and it increased in frequency and intensity working in concert with the weird space orchestra that laid waste to our collective psyche. The whole affair was surreal, creepy and unsettling — and there was more of that to come. Deeper into this House of Horrors, we cautiously navigated a corridor of decapitated heads, each hung from the ceiling. We were in the thick of these suspended death masks when a series of faint whispers began to grace our ears. The heads were talking, possibly plotting and they were all around us! Neither John nor myself had any desire to become one of their legion, so with our own heads on a swivel we ducked and dodged our way out of that most macabre menagerie. But it was the classic out-of-the-fire and into-the-frying-pan scenario as we were soon cornered by an odd old man who can be best described as a cross behind a fisherman and Gollum from The Lord of the Rings. His appearance was accompanied by a quirky soundtrack that left me with the distinct impression that the country folk had bred with carnival people. He croaked a few threats or warning or perhaps a combination of both and it was almost enough to distract us from the fact that in his left hand he held a large hook and on that hook was a double-headed baby and that freakish tyke had a twitchy arm! 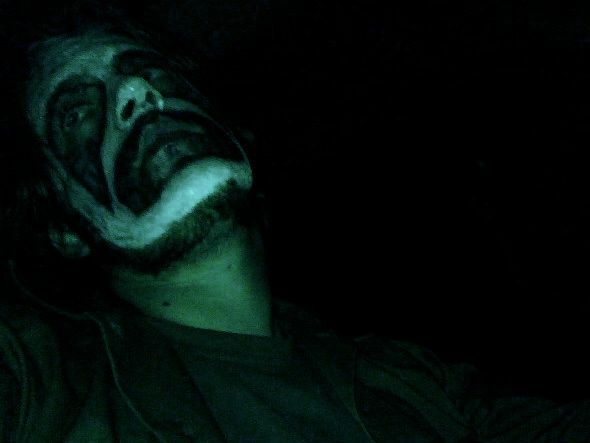 We figured it was likely that this Man Behind the Makeup was the same guy responsible for that ghastly collection of chattering heads and decided once more that ours were best left between our shoulders. We departed the clown archives but before House of Horrors was finished with us we had to survive a one-of-a-kind ambush from a gaggle of teddy bears that was equal parts hilarious and shocking. As we waited for one of the final wagons of the night to arrive, we swapped stories of haunting with a friendly, knowledgeable employee named Nick. These impromptu conversations are the unsung heroes of any haunt outing. The night had grown late and with the passage of time the temperature had steadily dropped which made the collective body heat of a packed wagon a welcome treat. We thanked Nick for his company and boarded the wagon to parts unknown. The group on the wagon revealed itself to be active and boisterous; the kind of folks primed for the kind of scares that the Hayride of Despair had to offer. Indeed, the very first scare was a simple flying prop that lunged from somewhere just above the cornstalks and momentarily seemed as if it would plop right down onto the head of one of the shrieking thrill-seekers. The hayride pulled guests around the perimeter of the corn maze and revealed a series of platforms where various scenes were in progress as the wagon lurched forward. One of the highlights involved a farmer who experienced a handful of trouble from otherworldly visitors. He shouted and pleaded with anyone who would listen that he had no desire to have his brains eaten; his rant concluded when he comically proclaimed that Steven Spielberg’s E.T. was a woefully inaccurate depiction of alien beings. As the ride continued a collection of ghouls began to board the wagon and they were not quick to depart, in fact the majority of them stayed aboard for the remainder of the trip. A few of the monsters even brandished weapons which included a chainsaw or two which made for some fun and interesting moments on a tightly-packed hayride; a body or two could be found writhing on the floor of the wagon. The Hayride of Despair wasn’t terribly long but it was of fair length and featured a fun and frightful mix of humor and horror. The vocal occultists near the end of the path, who threatened to pull riders from the wagon, was a fun and lively touch. 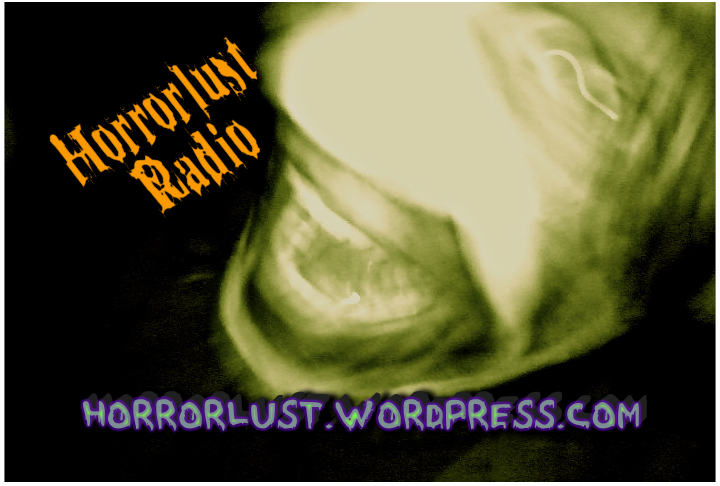 In episode #016 of Horrorlust Radio, I’m joined once again by fellow haunted attraction enthusiast, Mike Marvel. In this installment of Horrorlust Radio, Mike and I continued our discussion of haunted houses, specifically how such attractions can succeed or fail on the strength of a finale. This edition of Horrorlust Radio also featured interviews with the cast and crew of TNT Productions stage performance of Night of the Living Dead. Also included is an interview with Corey from Past Tense After Dark. Thank you to the latest sponsor of Horrorlust Radio, Krazy Hilda’s! 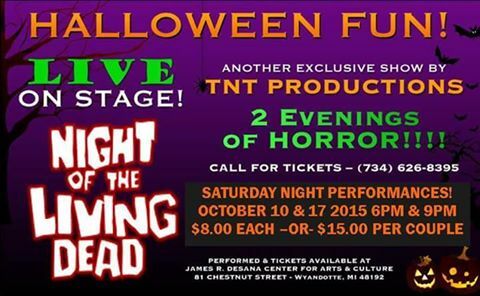 Join me for Night of the Living Dead this Saturday at James R. Desana Center for Arts & Culture located at 81 Chestnut Street in Wyandotte! 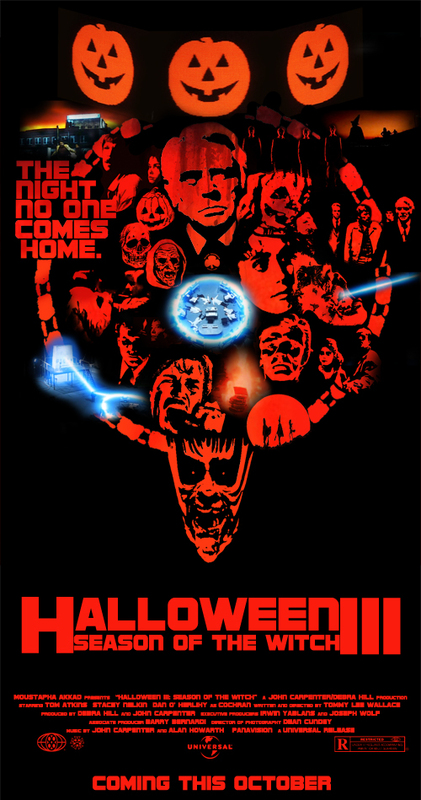 Halloween III: Season of the Witch may not feature the iconic Michael Myers but it did introduce a generation of impressionable youths to the hypnotic tune of the Silver Shamrock commercial. As a child I was quite horrified by the images of those masks that rotted the heads of countless unsuspecting kids. Following another Saturday night in the great month of October, we placed two more notches in the old belt after maiden visits to Tunnel of Terror in Rochester and Past Tense After Dark in Lapeer. Tunnel of Terror brought me back to my youth with an old school trailer haunt that pressed in on us from all sides. The pitch black passages and sparse scenery struck the right tone and left me brimming with ideas. Past Tense After Dark was a pure delight which exceeded expectations with a professional cast, superior detailing and a penchant for humor. The House of Horrors, in particular, succeeded on several fronts and rocketed to the top of the best of list for 2015. Full reviews to be posted in the coming weeks, of course. Thanks to Paul and Dan at the Tunnel of Terror as well as Nick and Corey at Past Tense After Dark for being gracious and knowledgeable hosts. It’s always fun to talk haunts and I enjoyed picking your brains. Corey even shared a great local ghost story — you can’t beat that! It will be a night of first time visits for us tonight and I don’t think there’s anything more exciting during the month of October than the chance to tour never-before-seen haunted attractions. First, we’ll check in with the Rochester Jaycees at the Tunnel of Terror! The Tunnel of Terror is a so-called trailer or modular haunt and quite frankly I have a bit of a thing for trailer haunts. The trailer haunt and other scrappy volunteer efforts formed the very foundation that the haunted house industry was built on, so any time I discover one I relish the opportunity to pass through its halls. There simply aren’t that many trailer haunts left in this area; I believe the last time I paid one a visit was four years ago. We plan to cap the night off at Past Tense After Dark in Lapeer which boasts three attractions — Hayride of Despair, Cornmaze of Fear and The House of Horrors. Past Tense After Dark is one of a handful of attractions that I’ve yearned to visit for a couple of years now and I’m happy to finally see a trip manifest. Originally, I had hoped we could also visit Scott’s Haunted Corn Maze, Hayride and Rooms of Terror but given the number of attractions between it and Past Tense After Dark, I think we’d be cutting it a bit too close. It’s a shame as we will pass Oxford on our way to and from Lapeer but such is the life of a haunter.